- Breeding value FN 2002: dressage-index 130 points! 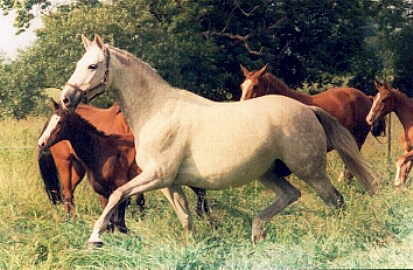 "Thirza" is a halfsister to "Thimur" by " Enrico Caruso", competing in dressage Competitions up to Grand Prix. 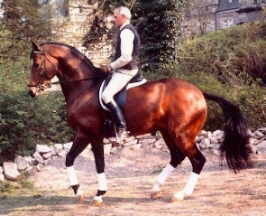 Her granddam "Thila II" is a fullsister to the S-Dressage stallions "Tempelritter" and "Tarim" (both USA). 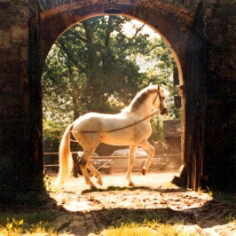 "Karon"(sire), "Falke"(grandsire) and "Condus" (greatgrandsire) competed all in dressage tests up to Kl.S! 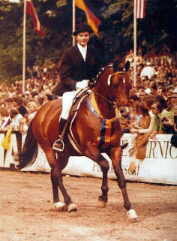 "Ibikus", who became Champion of the National Agricultural Fair (DLG) and who became fourtimes German Riding Champion, competed as well as his sire "Hertilas" very successfully in Dressage-Tests Kl.S.